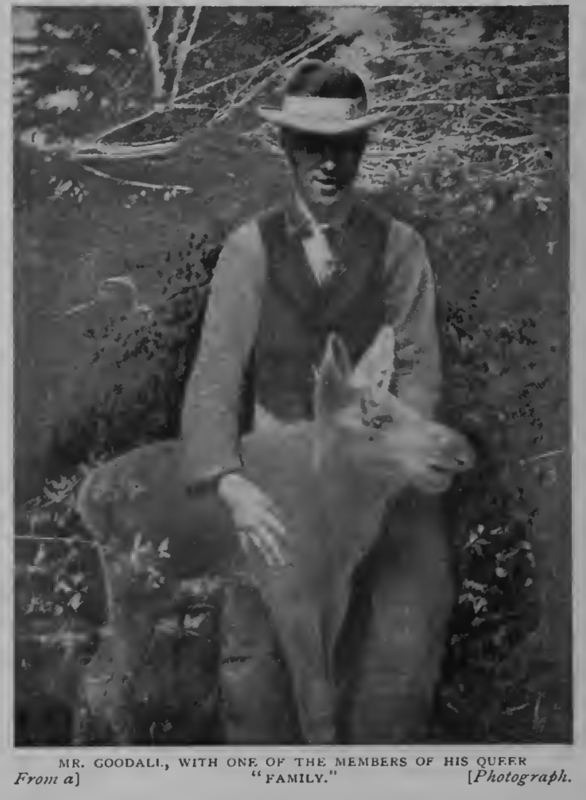 From The Wide World Magazine, 1908. Vol. xxi.-31. 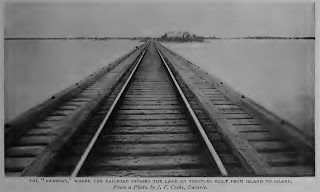 An account of an unconventional trip over the new Canadian Northern Railroad, which runs for five hundred miles through what is practically an uninhabited wilderness — a country of magnificent lakes, mountains, and forests, and one of the finest game reserves on the face of the earth. This image came from the web -it is a "Jigger"
FROM Rainy River to Fort Francis the road holds to the valley, never very far from the river. For fifty miles there is scarce a curve, and but a slight up-grade. Whenever we approached the river we came upon evidences of civilization—small farms tucked in between the woods and the river-bank, and hamlets with side-tracks and new depot buildings on one side, on the other the river, with the steamboat landing. About five o’clock there came into the cleared roadway from my right a black bear with three cubs. The evident intention of Mrs. Bear was to cross the track to the thicket on the north side. At the rate I was going it looked as though a collision would shortly occur, unless one of us should apply the brakes or take a switch. I was engaged in speculating upon the probable result when the old bear saw me, and, evidently not relishing a mix-up with so formidable a machine, changed her course and ran up the right of way between the track and the woods. She seemed determined not to return to the thicket out of which she had come. The cubs could not keep up with their mother, the logs and brush bothering them sorely. Like little children, they called to her to wait, which she did from time to time, looking back and giving them encouragement by variously modulated grunts, the while keeping an eye on the approaching jigger. It was during one of these pauses that Forde secured a snap-shot. It was three o’clock next afternoon when, our supplies having been stocked and our jiggers loaded, we started east. Before us lay two hundred and thirty miles of wilderness. An hour brought us to the “Narrows,” where the railroad crosses the lake on high trestles built from island to island. These islands, so runs the Indian legend, were placed there by a giant who used them for stepping-stones. Forde stopped here to secure views of the island-studded lake while I amused myself catching pike with bacon rind for bait. The sun was low when we were again on the track, rattling over the hollow trestles toward the pine forest of the north shore. 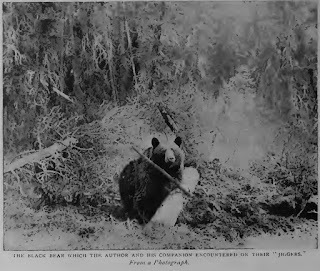 We had reckoned on reaching Bear’s Pass, a telegraph station, before dark and camping there for the night. But in the very middle of a swampy tract I felt my jigger pass over a torpedo (detonator) and in a moment came upon a train, loaded with ties, on the main track. To go on was impossible; there was but one thing to do—take the back track until a camping place with water could be found. We found the water, side-tracked our machines, and while I prepared supper Forde pitched the tent and made up the bed. It was here in the wet and the dark that Forde and I came to an understanding. Nothing was said, but a mutual respect was born which on my part developed into something very closely akin to admiration. When we sat down on a wet log to fresh fish, bacon, and fried potatoes, Forde began to thaw, and when he asked for a second cup of coffee he melted sufficiently to remark, “Well, you can make coffee.” The ground was soggy with recent rains, but when I found a bed of brush six inches thick, better than any hair mattress, I realized that Forde was more than a photographer—he knew the relations of man to the wilderness, and that was a great deal. During the night, sometime, a locomotive rushed by us screeching a salute; then, in a few minutes, it came thundering back with the train. The track was clear. Why the place is called Bear’s Pass does not appear, unless it be here that bears pass the winter. A more quiet place for hibernating either in winter or summer Nature never created. Bear’s Pass consists of a side-track, a water tank, a telegraph office, and a “public-house” built of logs and kept by John Goodall, if I remember his name aright. Mr. Goodall seemed to fit the niche which he had appropriated for himself. He acted as mine host, farmed a little, and served as guide to such sportsmen as chanced to penetrate thus far into the unexplored. He was a cross between a hunter and a trapper, with the instincts of a scientist. The delight of his life was his menagerie—his family he called them, and so he treated them. 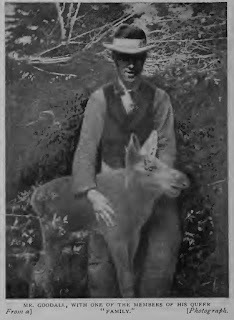 Bear cubs, woolly and lovable; a young wolf, restless and sinewy; a silver-grey fox and two of his red cousins; a family of porcupines, mother and two babes, innocent of quills; a bull moose, who was rapidly reverting to the habits of the wild; a deer that after two weeks of captivity and kindness would stand on its hind legs and eat from its master’s hand; a calf moose, the personification of humorous awkwardness; and a half-grown panther, in a wooden cage, constituted the four-footed contingent of the collection; and, in addition, there was an eagle who looked with lordly contempt upon the half-dozen loquacious crows who had joined the colony for revenue only. The lack of fear exhibited by the wild animals of this region is a revelation. Mr. Goodall told me that the deer became so accustomed to the presence of the construction crews of the railroad that they would climb the steps of the cook-car for bits of bread and sugar. This I can well believe from my own subsequent experience. From Bear’s Pass to Steep Rock Lake the railroad follows the general course of the Seine River. It is a rugged road, but full of pleasant surprises. The surveying engineers seem to have exhausted the possibilities of curves. Curves double and triple, simple and compound, skirt the water, or hug the projecting promontories of basaltic rock. A camp at Loon Lake closed the day—a day of severe toil. My muscles had become some­what hardened, but Forde’s were still soft, and the exertion began to tell on his spirits. He grumbled about his jigger, and wondered how he had ever lent himself to such a foolish expedition. 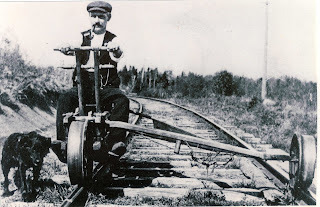 Why two sane men should ever agree to pump themselves for five hundred miles over a track so crooked that a snake would break its neck trying to follow the rails was beyond his comprehension. When 1 awoke in the night with the muscles of my arms and back stiff and sore—so sore that sleep was impossible—I was constrained for the moment to agree with Forde and pro­nounce the expedition a “fool’s errand.” But when I left the tent for the canopy of the stars, and on the beach listened to the multitudinous voices of the dark; listened to the lonesome call of the loon across the slumbering waters; to the cry of sleepy birds disturbed by some night prowler; and harkened to the faint rustle in the bushes where the curious, fear-born children of the wild watched, I felt the thrill of the great forest, and the mysterious witchery of the night wrapped me like a mantle. What are toil and fatigue when we may sit face to face with Silence, the Night, and Nature? At seven o’clock we were on the track again, and I led off at a pace that soon left Forde far in the rear. The morning was glorious, the air filled with the odours of lake and woods. My spirits had regained their wonted tension; the previous day, with its heat and up-grades, seemed a long way off. For an hour I reeled off curve after curve, passing through numberless rocky cuts, where a collision either fore or aft would have been fatal — at least to my jigger. I had scarcely entered upon a mile stretch of straight track when, hearing a whistle, I looked over my shoulder. There, not forty rods away, and coming at full-speed, was a special! To apply the brake and derail my machine was the work of the fraction of a minute. As the locomotive passed me I involuntarily looked at the pilot for pieces of Forde or his outfit, for I could not conceive how a collision could be avoided among those curves and cuts. I waited ten, twenty, thirty minutes, and was getting nervous, when around the last curve came Forde, leisurely pumping his machine as if nothing had happened. “Well, I’m glad to see you. I was beginning to think I should have to go back for the remains. How did you do it?” said I. “What did you think it was?” I asked, irrelevantly. Evidently Forde’s muscles were still sore. Steep Rock Lake is near the head-waters of the Seine River, at the centre of the Rainy Lake gold region. 'Ten years ago large sums of money and a vast deal of energy were spent in prospecting and in attempts to develop certain favourable locations. The almost universal failures that attended these ventures were due not so much to the lack of gold quartz in paying quantities as to a lack of transportation facilities. Everything taken in or out of that gold region, from a pound of bacon to a stamp mill, had to be boated and packed over the portages. The coming of the railroad, therefore, had temporarily revived the interest in gold-mining. The Elizabeth Mine, a gold proposition located on Steep Rock Lake, was attracting some attention. The management was putting in a ten-stamp mill, so we put it on our list for investigation. As to location, we were told it was on Steep Rock Lake—that was all. 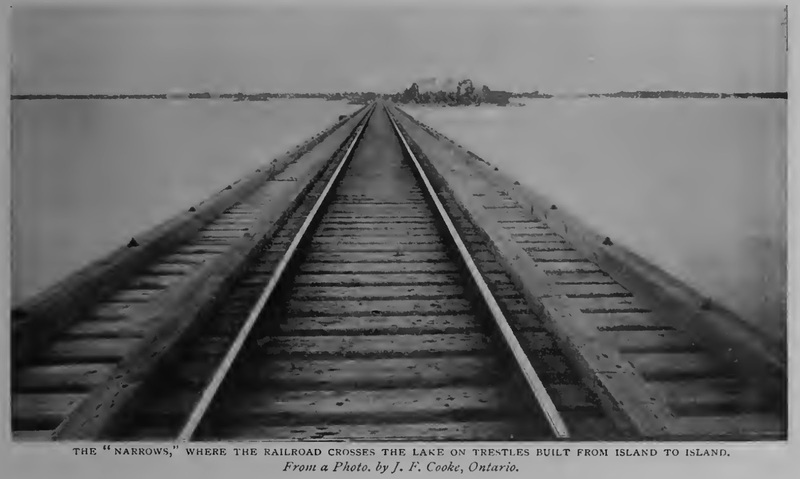 The railroad skirts the south shore of the lake, and a spur had been put in to accommodate such freight as might be billed to that point. Arriving about ten o’clock a.m., we began to cast about for some means of reaching the mine. Beside the side-track and a single freight-car there were no signs of human habitation visible to the naked eye. On the beach, how­ever, we found an abandoned canoe. If was rotten and leaked like a sieve, but it was a canoe. The holes Forde caulked with moss, improvised paddles out of two pieces of board, and, loading the large camera (boxed), we shoved off, I in the bow, Forde in the stern. 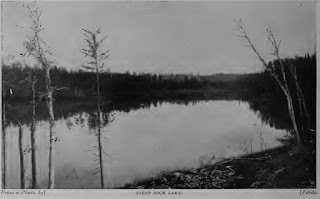 Steep Rock Lake, be it understood, consists of a chain of lakes connected by links of small streams more or less navigable for canoes. These geographical facts we had to discover. After circumnavigating the first lake we were about to give up the job, when we noticed bent and broken reeds. These gave us a hint. We followed the way they pointed, and were led to an inlet well hid with foliage, up which we paddled to a larger lake. Midway between the lakes we came suddenly upon two moose standing belly-deep in the marsh, not ten feet from the creek channel. Here we were in a rickety canoe, with the camera securely boxed and with not even a Kodak to get a snap-shot at a spectacle that one does not see twice in a lifetime! Forde is not profane—he is altogether too sparing of words to employ vain speech—but 1 thought I heard something from the stern paddle that it would not do to print. By following the reed sign-boards we crossed another lake, entered a secluded bay, and there, looking south from a sunny slope, were the neat log houses of the mining company. Back a mile from the shore were the mine and the quarters of the men. It was past noon when we arrived. With the cordial hospitality of all camps, we were ushered into a large room filled with long tables, where we sat down to a dinner I shall remember as long as my stomach craves food. It consisted of moose steak—tasting like a cross between venison and the tender porter­house of a young steer — dried apple sauce, great bowls of it, and pie—real pie, such as you get only in logging and mining camps. And then, to wash all this down, we had cups of that delicious Canadian tea. The hunger sauce we brought with us may have had something to do with it, but that feed with the gold miners of Steep Rock Lake I now remember with as clear a gastronomic vision as I do the hot biscuit and new maple syrup of my early boyhood. We finally reached the railroad yards at Port Arthur, sunburned, dirty, and tired. We had arrived at the lake, but the end of our journey was not yet. Among the wildest parts of North America within reach of civilization is that portion of Minnesota and Ontario adjacent to this boundary line. Into this wilderness as far as Gunflint Lake, a distance of a hundred miles to the south-west, a logging railroad had been built. This road was acquired by the Canadian Northern, and made a part of the system. It consisted of little more than the road-bed and the iron; there were no telegraph-wires and no station-houses. It ran nowhere and ended in the forest, but it was the way into the greatest game preserve west of Nova Scotia. Forde had been over the line and warned me that, on account of the grade and other physical conditions, an attempt to make the outward run on our jiggers would be little less than suicide. Yes, we could come back easily enough; in fact, we would have to apply the brakes. I called on the assistant superintendent. Yes, they were running log trains out to the end of the line every other day. I explained our dilemma, and he agreed to make up a special to leave at nine o’clock the next morning to take us and our jiggers to Gunflint Lake and bring back a load of logs. It was a few minutes before nine when a locomotive and four flat cars, with a caboose, pulled up before the station. I had the jiggers loaded, and was getting the tent and kit and a part of Forde’s paraphernalia into the caboose, when I observed that it was nine o’clock, and Forde had not shown up. Forde never did anything until the time came—and then it must be his time. The train was in charge of a young conductor, fresh to his work, and full of the “orders-is-orders” enthusiasm. The instant nine o’clock came the conductor gave the signal to start. “Wait a minute; here comes Forde!” I yelled. “Can’t do it—orders to leave at nine,” replied the conductor. And off went the train, with a part of our stores, and Forde coming leisurely along half a mile away. Fifteen minutes later the train backed into the station, and a madder young man than that conductor I never saw. But he had to contain his wrath and be civil. It was good discipline for him, for he was young and headstrong. As the imperturbable Forde and I took our seats in the caboose it was an open question with me whether I would prefer to be a millionaire or a train-dispatcher. From the Height of Land to Lake Superior the distance varies from forty to one hundred miles. The rivers of that slope, therefore, are rapid and turbulent. The erosive work of ages is seen in the vast canyon beds and the now wooded valleys that lead to the lake. Up one of these ancient river courses, now marked by a chain of long, quiet lakes connected by short river-links, runs the railroad. At three o’clock in the afternoon our puffing old locomotive came to a stop near Flint Lake, or Gunflint Lake as it is marked on the maps. We were now on the boundary line. 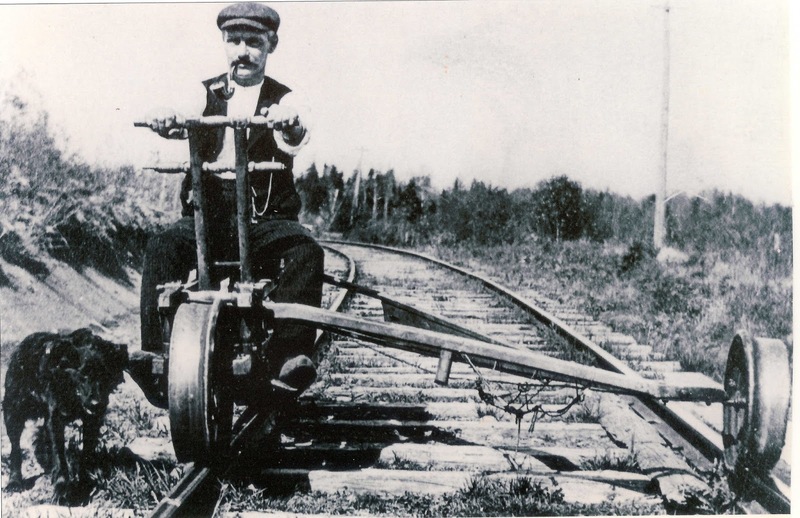 The road extends six miles farther into Minnesota, but Forde refused to make the run, for fear, as he said, that the grass along the track would clog the jigger wheels. One reads much in the magazines about hunt­ing the moose in the wilds of Maine. The literature of the sportsmen, written in the East, of necessity deals with the game haunts of the East. Their relative importance, therefore, becomes greatly magnified in the public mind. All the available hunting-grounds of Maine, New Brunswick, and Nova Scotia would not make a back-yard for the moose country of the Canadian North-West. 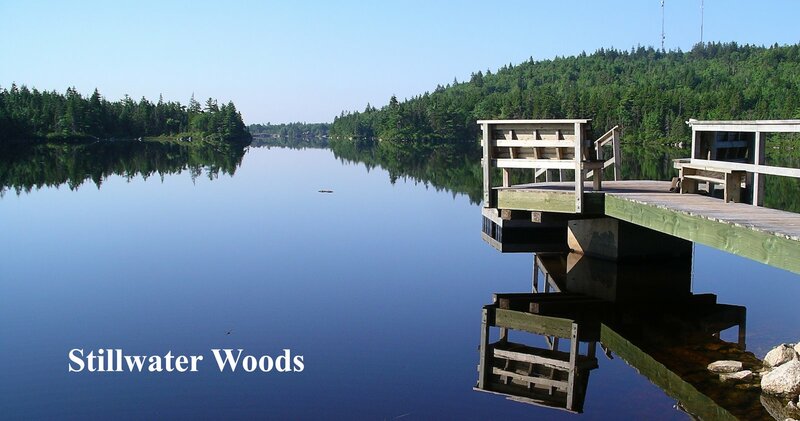 Gunflint Lake is in the very heart of the moose haunts of Northern Minnesota and New Ontario. The region can be reached only from Port Arthur or from Ely. 'The country is particularly inaccessible; the professional game-killer has not as yet invaded it. Moreover, the Indians are on reservations and the game laws are strictly enforced. The effect of this protection is seen, not only in the quantity of game, but in the disposition of all animal life toward mankind. From the squirrel to the moose you encounter curiosity rather than fear. Along the railroad and by the shores of the lakes are runways beaten by unshod hoofs, like cow-paths about a pasture. Mother Grouse was out with her family in the open sunny patches along the railroad, for it was September. They scurried across the track ahead of the jiggers and then peeped at us from the cover of raspberry and hazel bushes as we passed. We pitched our tent on a grassy plot overlooking the historic lake. There was frost on the ground and a white fog hung over the water when we unrolled from our blankets in the morning and went down to the beach for a dip. The water felt warm in contrast with the bracing air. Previous frosts had visited the valley, and the woods were already clothed in the fantastic mourning of autumn. The gold of the birch and poplar and the crimson of the northern ivy and an occasional maple, accentuated by the dark green of the ever-present spruce, afforded a colour scheme that Nature alone produces— and that only in the Northland. It was a pleasant run down the sunlit gorge in the crisp air of the early autumn, along the shores of placid lakes, silent and blue, by winding brooks that play hide-and-seek with the scarcely less winding track. Here we stopped at an abandoned lumber camp, with its reminders of a hardy life. The inquisitive raspberry, that half-civilized child of the open forest, looked in at the windows; the owl sat blinking on the upper bunks, and on the floor were evidences of the hedgehog’s nightly revels. Some of these camps are to be fitted up, I understand, for station-houses and the accommodation of sportsmen. It would be a shame to introduce modern structures to mar the beauty of this land of silence and peace. My watch showed six o’clock when we crossed the bridge over the Kaministiquia and slowed down at Stanley Junction. Here we locked our jiggers, put our tent and kit into the freight-house, billed to Winnipeg, and went to the hotel for the night. In the morning we secured reserved seats on a gravel train bound for Port Arthur. “How about specials West?” I inquired, when I got there. “Good; I’ll take it,” I said. I bade my friend Forde good-bye with real regret. I had learned to like him, and the interest seemed to be mutual. I was glad the “fool-killer” had not got him before our paths crossed. From the outlook of a plunging caboose (I was not invited to a seat in the private car with the Hon. X—, member of the Dominion Cabinet) I reviewed the scenes of our toil. Well, it was worth it. My muscles were like iron. I felt that I had worked myself to muscle and bone, but the scales said I had gained eight pounds in four weeks.